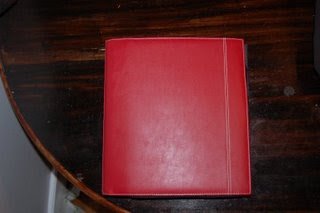 I use a leather 3 ring binder ( leather so it is durable). I got this one at Target. 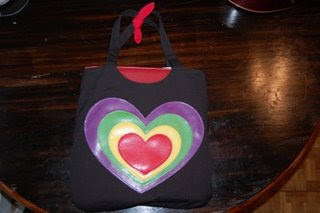 It has an accordion file in the front where I keep the weekly ad of the store I am shopping at. That section rotates based on where I am going, that way the binder doesn’t get any bulkier than it is already. 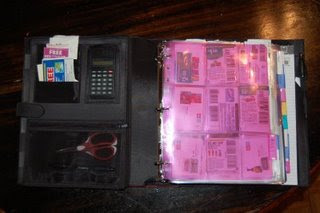 The back has a built in notepad I use for my grocery list and there is a pen holder. Then I have a calculator and a zipper pocket with scissors and a backup pen. Next I have my categories. Each category begins with a labeled pocket tab. 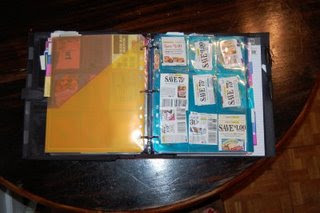 That way I know what section it is and when I am unable to file coupons I can stick them in the appropriate area. 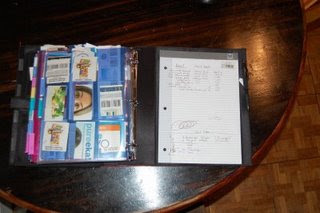 Behind each tab are baseball card sleeves. I like these best because they hold 9 coupons per page and I can use front and back. I ordered collector card sleeves from online because they are sturdier and I don’t want to be constantly replacing my pages. This system allows for easy viewing on the go. I tend to group in each slot coupons for the same item and/or company depending on how big the section is, I don’t want it to be too time consuming to file. I also have a separate file that I keep my weekly ads in for reference which I purge each week as I replace the ads with current ones. This file also holds my coupons for restaurants, entertainment, clothing and anything else I have. I find this system very convenient on the go, child proof and easy to use. It is bulky but I am fine with that. It is not for everyone but hopefully this will help you get an idea of how to file your own coupons. Thanks for letting me share how I organize my coupons, you can find me everyday at Thrifty & Chic Mom please stop by and say Hi! Previous PostAnd the winner is…Next PostShe stripped and it got her a PRIZE!